As many of you know, I attended the Association of Writers and Writers Programs (AWP) conference in Los Angeles, California this year—an experience that was partly funded by the generous Creighton University. It was my first time attending an AWP conference and it was amazing. My fellow writers Nate Sindelar, Maranda Loughlin, Arnie Hermes, and I embarked upon a cross-country adventure to the land of sunshine and starlight. Despite the madness of driving twenty-two hours and thirty-six minutes straight (roughly thirty hours after some stopping and set-backs), we decided to be brave and to make it a priority to see some of the scenery of the western United States. As expected, it was an exciting and perilous adventure. We began the first part of our journey through Nebraska in the early morning, the Monday before the conference. It seemed even the birds had gotten the message that now was the time to travel. As I had the privilege to sit in the back of the car for a while, I used that time to catch up on some shut-eye, to read a bit more of Ready Player One, and to—of course—write a bit. It seemed like very little time before we were entering Colorado, one of my favorite states in the U. S.
As we climbed in elevation, I looked forward to seeing the Rocky Mountains again. The first time I saw the Rocky Mountains was at the Rocky Mountain National Park during a first year anniversary retreat with my husband. They were awe-inspiring then and they were still awe-inspiring the second time around. The mountains first appeared on the horizon like low-hanging clouds. As we drove closer, the sheer cliffs and evergreen trees, the snow caps and valleys, all came into clearer view. We stopped in Denver, Colorado to peek our head into a bookstore (true to our nature) and for some food. However, only one could order the fish and chips. Nate and Arnie decided to participate in the 76th Hunger Games. Back on the road, we eventually drove far enough to reach Utah. In terms of fun, Utah was the opposite of Colorado. At night, heading down a mountain, it began to snow. Fortunately, we were using Maranda’s four-wheel-drive Jeep. Unfortunately, I was the one who had to drive through it. The roads and visibility became bad enough that I had to pull over. Nate informed us that the snowfall might not end for a couple of days. Nate decided to take over the driving. The rest of us watched for cars and other potential hazards. Traumatized, sleep-deprived, and terrified, we drove onward. When the snow finally let up, Nate pulled over and allowed me to drive again. I made it only so far before we hit another pocket of the snowstorm and we were back to the dangerous conditions of before. This time there was a snow plow ahead of us. I decided I needed to go slow anyway and followed the plow for a while. I relied on Flogging Molly, Queens Of The Stone Age, Metallica, and Rush to keep me awake and alert—although, in retrospect, this might have been a bad choice because it made me want to drive faster than I was going and also seemed to heighten the drama of the event. Alas, I regret nothing (mainly because I didn’t kill us or wreck the car). When I feared I would fall asleep if I went on any longer, I finally gave up the wheel to Maranda, who eventually became too tired as well. We parked the car briefly and got a few hours of much needed rest (I may or may not have had my mouth attractively hanging open in my sleep). Then we were off again. We were about to enter Las Vegas as the sun was peeking over the horizon. I didn’t have my contacts in at this point (I was not driving) and so everything was a bit hazy for me. What I remember is the desert in its darkness and then all of a sudden there was what looked like a massive grid of lights sprawling before us. We were tired, and not so interested in Vegas’s flashy advertisements at the moment, so we drove straight through. I did manage to snap a blurry picture or two. From there we drove through the desert to California. I remember thinking as we were winding through the mountains that everything was so beautiful. The rock faces, the wildflowers, the array of colors, the sunshine—I felt as if, maybe not so surprisingly, I’d stepped into a movie. I wondered when the Indominus Rex would come storming down one of the mountainsides or when Bumblebee and Megatron would make a crash-landing into the middle of the freeway. When we finally got to LA, I met our host and Nate’s friend Nathan (yes, I know many people with Nate/Nathan names). He was a stellar guy, let me tell you, and even more so for letting us crash for free in his living room for nearly a week. We found out his roommate, Tevin, who happened to be an accomplished slam poet and in the know about the local writing scene, was also wicked cool. Nathan took us to some great places in downtown LA. We got some amazing coffee, excellent food, and—of course—visited a bookstore. The Last Bookstore was probably one of the coolest places I’ve ever had the privilege to visit. Set up like a sort of maze (the upstairs is called the labyrinth), there were all kinds of books in nearly every genre. The horror vault and the bench made out of an old, Chevy pickup truck tailgate sealed my love for this place—but there were all kinds of cool displays that made the store feel downright magical. There were even readings going on when we visited, which were entertaining and often comical. I think I would be happy living my last days at The Last Bookstore during the end of the world. The next day we went to Donut Friend in Highland Park and then onward to Venice Beach and Hollywood. It was an amazing day, filled with great food and wonderful company. We also set up the booth for the AWP book fair. We were representing the Creighton University MFA program, Blue River, and Brighthorse Books. We even had the chance to pass out information about Theodore Wheeler, an accomplished Creighton MFA alumnus. Thursday was when the real madness began and it continued through Friday and Saturday. AWP is a huge conference with more than 12,000 attendees and it only gets bigger as the years go on. The Los Angeles Convention center was huge, but they also had panels in the Marriott across the street. You almost had to take a whole day to check out all of the book fair booths. It was pure bliss to see so many people that cared about the written word and the power of poetry and prose. I met some really fantastic people, from the very accomplished to the new professional. There were so many on-site and off-site events that one could only attend a small fraction of them. I really enjoyed the speculative, young adult, and publishing industry panels I attended. There was a great deal to learn about the politics of writing and publishing. I’ll never forget seeing three of my favorite authors—Kelly Link, Emily St. John Mandel, and Ruth Ozeki—on stage during the Penguin Random House Speakers Bureau panel. Nate, Maranda, Arnie, and my professor Mary Helen Stefaniak came to support me. Nate took this photo. I also had the privilege Thursday night, thanks to the amazing editors of F(r)iction, to be part of an AWP off-site event called Literary Friction. Andrew McFadyen-Ketchum was our host and a representative of all three organizations that put on the event—F(r)iction, Floodgate Poetry Series, and poemoftheweek.org. I was in the company of some serious talent—Anders Carlson-Wee and Kai Carlson-Wee, F. Douglas Brown, Geffrey Davis, Nicky Beer, Scott O’Connor, Paisley Rekdal, Campbell McGrath, Simone Muench, and Lynn Emanuel. Their work was at times breathtaking, at times heart-wrenching, and at times rather hilarious. It was so wonderful I had to keep telling myself it wasn’t a dream and that I was really at These Days Gallery, reading an excerpt of “When Continents Collide” alongside these amazing writers. Friday evening, I had the pleasure of meeting up with one of the professors who taught many of my creative writing courses at Salem College, Aimee Mepham (read “The Blacklisting of Sweet Kiss” and “Raving Ones“). Catching up with her over dinner was such a blessing. Her endless hard work and dedication to her craft really inspire me. When Sunday rolled around, it was time to head back to Nebraska. We bid farewell to Nathan and Tevin and began the journey home. We decided to take a southern route to avoid any more snowy mountain passes. On the way, we couldn’t resist making a stop on the edge of the Mojave National Preserve. Then we traveled through Arizona—stopping for dinner in Flagstaff to check out the scene and another bookstore—, New Mexico, Oklahoma, and Kansas. I felt very blessed to see parts of this beautiful country that I had never seen before. My first experience with the AWP conference was wonderful. I understand there are those who do not enjoy it and I empathize. But I can honestly say it was one of the best decisions of my life to go to this conference. I owe a lot of thanks to a lot of people and I hope by now they know I’m grateful. I will take the things I’ve learned and use them to help others and myself as we all continue our literary journeys. My fellow writers, I have exciting news. Blue River, a non-profit literary journal produced by Creighton University’s MFA program, is now seeking submissions. There is also a chance to win $500. If you don’t know Marc Moorash and Ava Dawn Heydt (a.k.a. Mr & Mrs Garbanzo) then you are missing out. They are some of the kindest, quirkiest, professional-and-yet-fun editors in the literary world. 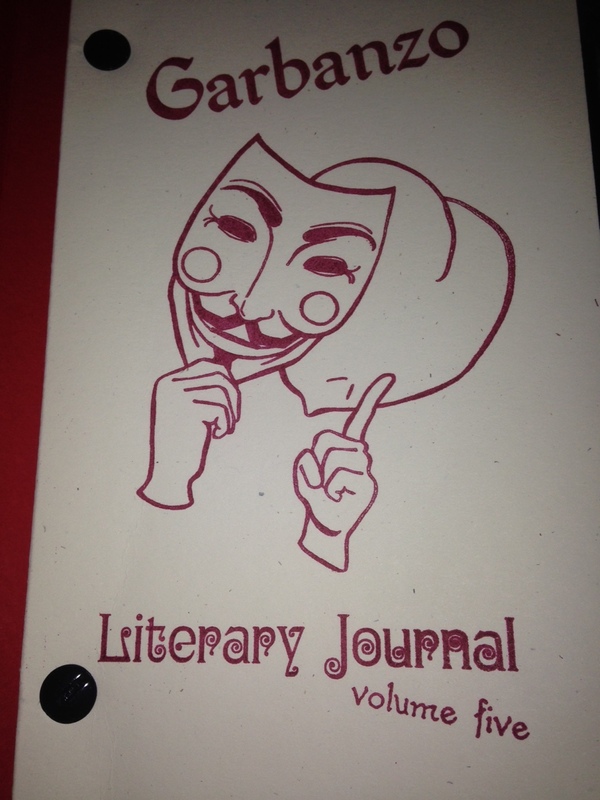 Together they run the fantastic, quirky, artistic Garbanzo Literary Journal. I had the best experience working with the editors. They didn’t charge a reading fee. They agreed to publish one of my submissions. They updated the writers regularly on the process. They responded to my few questions. Finally, I received a complimentary print copy of the journal plus a kind letter and a package of garbanzo beans! My work, “Old Betsy’s Obituary,” written under my pen name L. N. Holmes, was featured in section three. To say it was the best experience I’ve ever had at a literary journal would be a gross understatement. Mr & Mrs Garbanzo run a great operation together. I thank them for the chance to be featured in their publication. “Old Betsy’s Obituary,” which won a first place prize from the North Carolina Media Association Statewide College Media Awards (LeeAnn Holmes/”A Death in the Family”/Incunabula/Salem College), will be featured in volume five of Garbanzo Literary Journal. If you want to read some of my writing, the journal is now available for preorder from Seraphemera Books. Part of the story is available for preview on the website. Much appreciation to those who share this post and thanks to all of my followers and readers for your continued support!